Trying to get more members for your gym? Are you using landing pages to convert your website visitors? If not, stop whatever you're doing and pay attention. If you're paying for costly online advertising, amping up your social media marketing, or creating marketing campaigns to drive traffic to your website you need to be using landing pages. I'll explain why. A landing page is designed for a narrow purpose. Compared to your typical website homepage a landing page has what marketers call only one conversion goal. In other words, a landing page is designed to focus only on converting the traffic it receives into leads (a name and an email). Nothing else. It does away with things like a menu, footer, or other pages. In doing so there are less distractions on a landing page. Visitors have only two choices upon arrive on a landing page—convert or leave. It's simple logic. The less options a visitor has to choose from the more likely they'll complete your desired conversion goal. That's why landing pages enjoy much higher conversion rates than a homepage. 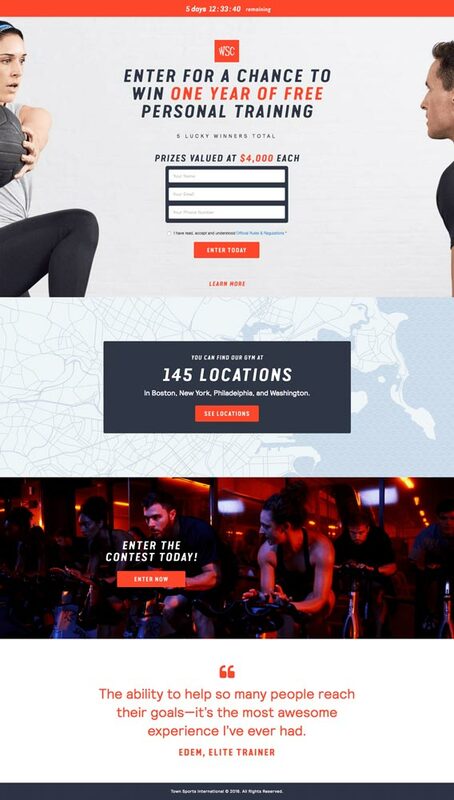 In this article, I’ll show you 11 fitness landing page examples and explain what makes each successful. Note: All of these stunning landing page examples were created on the Wishpond platform. If you want to create your own click here to try Wishpond free for 14 days. 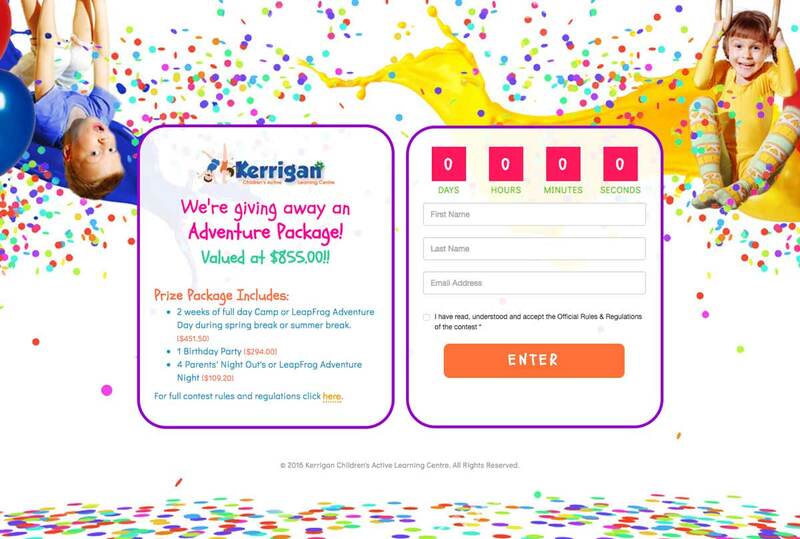 Kerrigan, the children's fitness and activity centre, used this landing page to give away a massive prize package and collect leads. Their goal was to collect leads and increase the exposure of the business in their local area. The simple design. The centre focused elements make it easy to focus on the most important elements on the page. The colourful background and exciting use of colour draws the eyes inward to the form. The imagery. The smart use of imagery helps represent the target audience Kerrigan is trying to reach. It works to build trust from visitors and make them feel comfortable converting on the page. 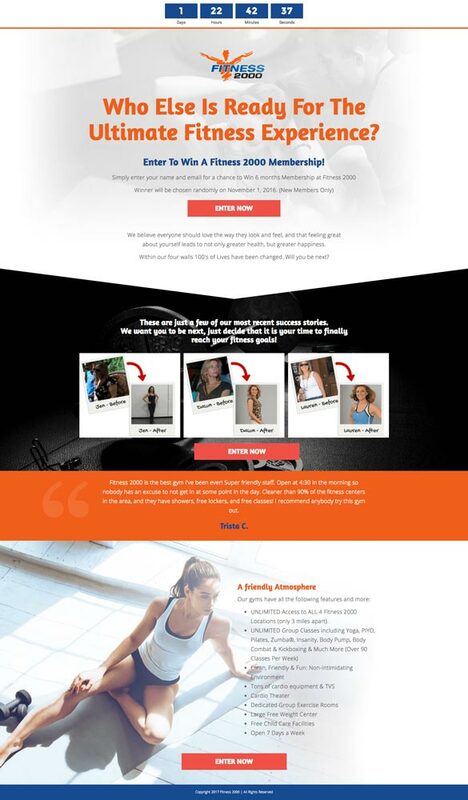 Clarendon Fitness used this landing page to give their visitors a free fitness assessment with $1000 off personal training classes. Clarendon wanted to get the most return from their online advertising and combined the power of a landing page and an awesome offer to convert their ad traffic. The form. Great use of contrast makes the form easy to read and complete. The dark background, bright colours, and directional cues (arrows) draw the eyes toward the form. Transformation photos. Showing real results go a long way to build trust with your visitors. Seeing concrete examples of what you can do and what results you can provide builds trust. Trust that you can come through on your promise to your visitors. 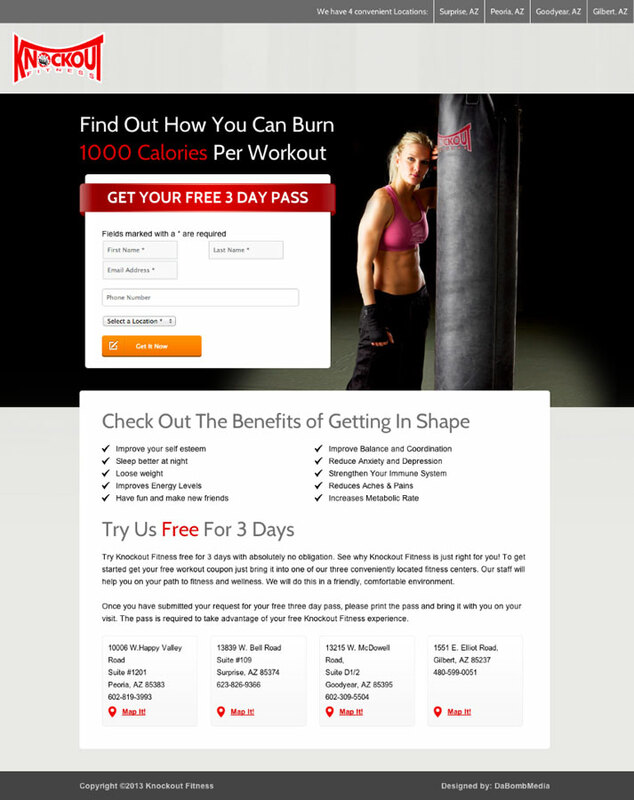 Core24 used this landing page to offer their visitors a chance at winning free personal training for 6 months. We love the minimal yet colourful design and powerful imagery. Clean design. Nothing distracts from the offer and the copy on the page. Each feature of Core24 is put up front and centre. Copy is easy to read and well contrasted. Client testimonial videos. Testimonials, especially on video, do a ton to add trust to your offer. Showing concrete evidence of the success you've had with clients adds value. Fitness 2000 offered their visitors the ultimate fitness experience, a free 6 month membership. Client testimonials. Fitness 2000 puts their successes right in the spotlight with transformation photos and testimonials. List of features. Fitness 2000 lists all the features that separates them from their competition. Using a short bullet point list makes the copy quick to read and understand. 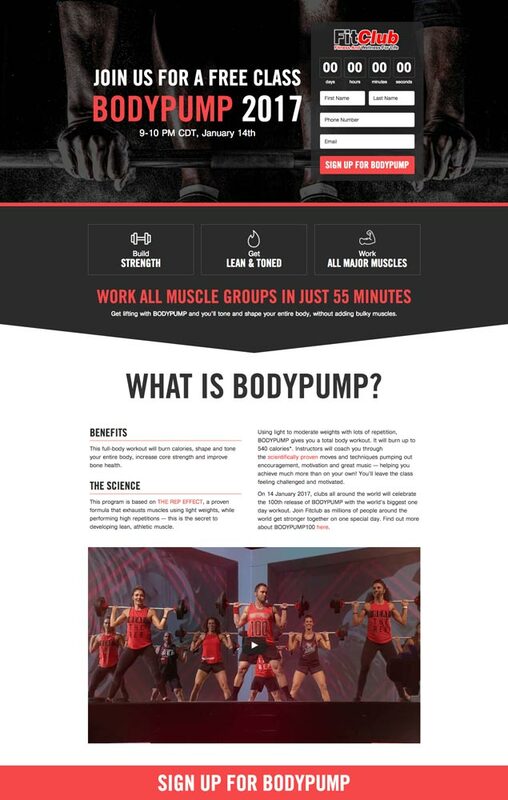 FitClub uses this landing page to register their visitors for a free bodypump class. They wanted to collect leads by offering a free group fitness class. It gets visitors through the door and engages new visitors with the FitClub brand. What is BodyPump? This section is crucial for explaining the concept of BodyPump to those without any experience. Having areas like this on your landing page will help explain terms or confusing jargon to new visitors. Graphics. Reading online is not like reading a book. Reading online can be described more like skimming. Studies show that most people read in an F shaped pattern, skimming and stopping at areas of interest. Using graphics instead of copy or to supplement copy helps your visitors. Graphics act as visual aids to help you communicate faster. Use graphics where possible to help ease the process for your visitors. 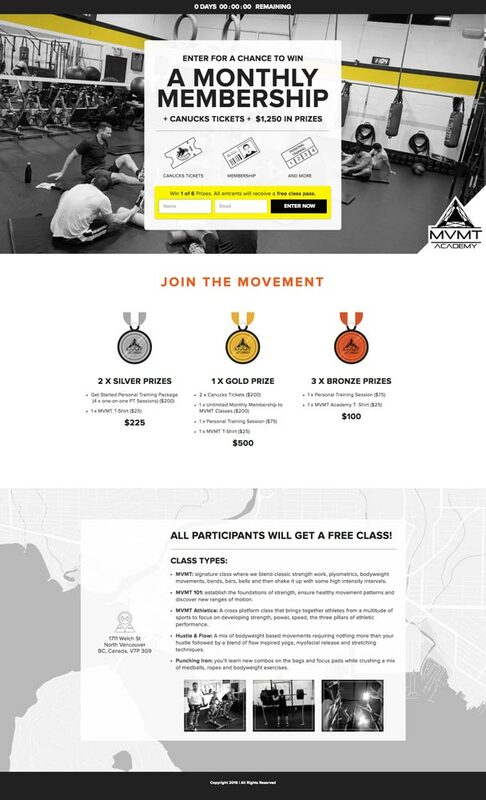 MVMNT Academy used this landing page to enter visitors for a chance to win a free monthly membership plus tickets to see the Vancouver Canucks. They used it as a way to get more exposure for their new gym and collect interested leads. Simplicity. The design, the monochrome images, and the simple contrast make this landing page very easy to read. The design does, though visually beautiful, is get out of the way of the offer. Nothing confuses the communication or gets in the way of visitors learning about what are receiving. * Gold, silver, bronze. * The fact that more than one person can win helps this landing page offer appeal to more people. Everyone is literally a winner. Enter and get a chance to win, plus receive a free class just to try it out. 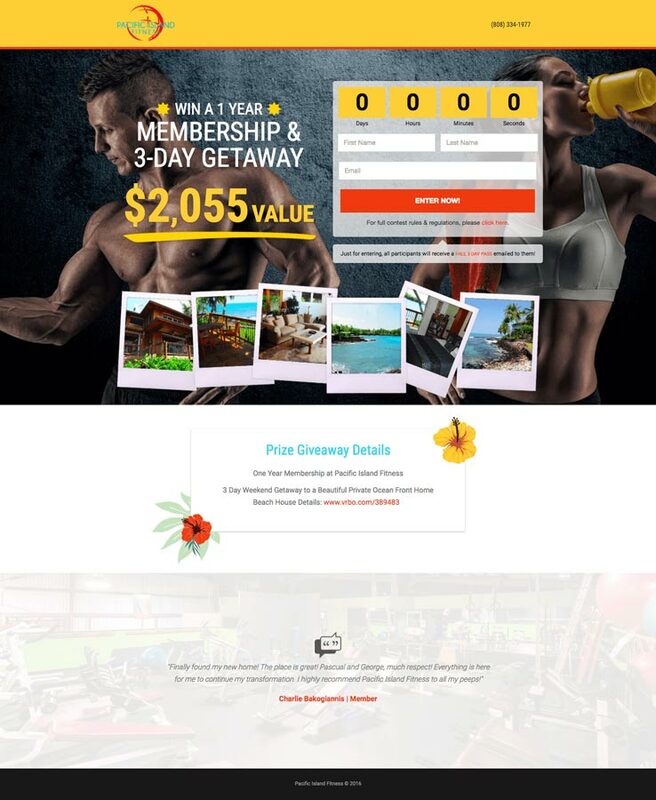 My Sports Club used this landing page to give their visitors a chance at winning one year of free personal training (valued at $4000). 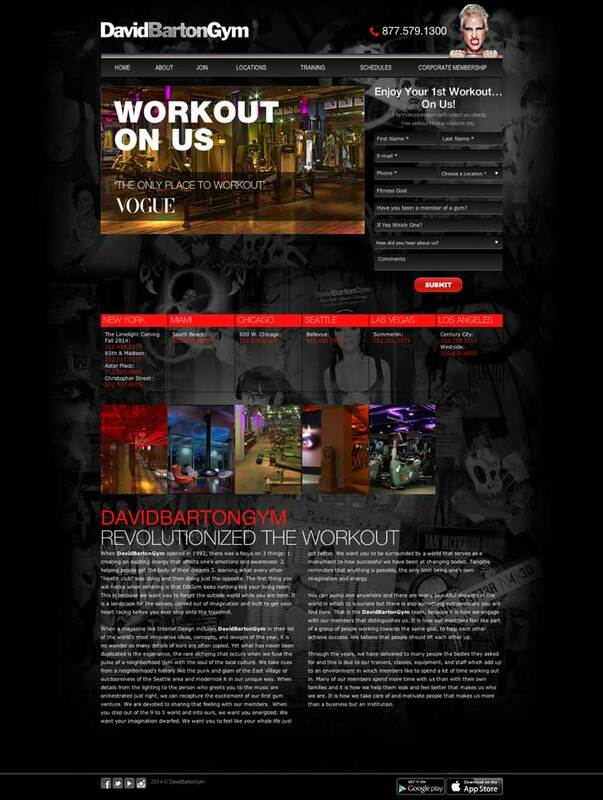 Their aim was to increase exposure in the local areas of their gyms. Custom photography. To my knowledge this is the only gym on this list that used custom photographs created specifically for their brand. You can see the difference it makes. The images match the look and feel of the brand perfectly and result in a beautiful landing page. Simplicity. Like a few of the other templates on this list, My Sports Club keeps their design simple. The text is easy to read and the photography adds, not subtracts, from the copy on the page. OSP used this landing page to find applicants for their eight week complete body training program. They wanted to find new trainees that were interested in losing weight and increasing lean muscle mass. Video. Amongst several things that add trust and credibility to a landing page, video ranks high on the list. High quality video, done right, is a great way for businesses to communicate a certain level of trust and legitimacy. Stories. For those unfamiliar with your fitness brand, having real people and real results goes a long way. Areas that communicate your story and elaborate on why you're the best choice are crucial to sway a visitor's decisions. 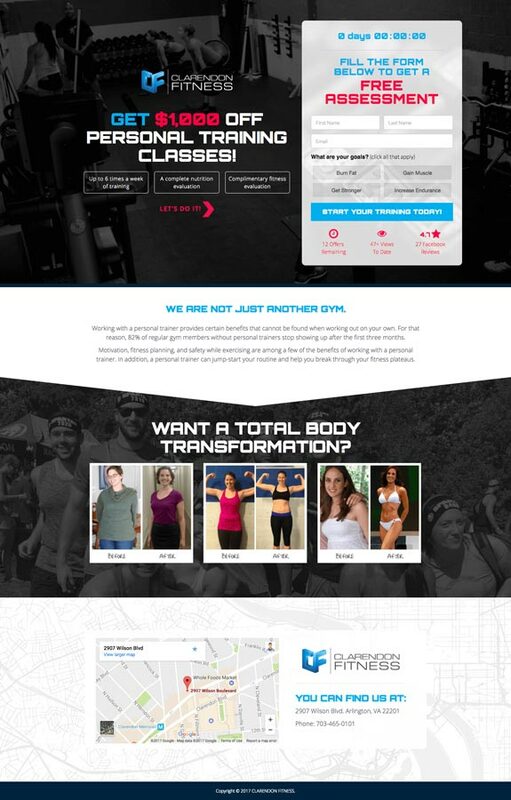 Here's a fitness landing page example that I can confidently say needs a bit more love. More information is needed to convince visitors on the 'why.' Why should someone join this gym and accept your offer? Features, customer success stories, or testimonials all can help elaborate on what makes Pacific Island Fitness unique. But they do make up for it by offering an awesome prize: one year membership and a 3 day island getaway vacation. PWC used this landing page to offer up a free 7-day pass and a chance to win 6 months of personal training. Once a visitor opts in to receive the free 7-day pass they're automatically entered into the contest. Clarity. The rules and guidelines of the offer are outlines clearly right below the form. Visitors can easily see what they stand to gain and what they can expect from a relationship with PWC. Contrast The dark coloured copy is super easy to read against the white background. When it comes to designing a landing page, ease is very important. Complex language, jargon, or run on sentences can all ruin the experience. This goes for contrasting text sizes as well. Make what you want your visitors to notice BIG and everything else smaller in relation. True Health and Wholeness uses this landing page to book free consultations for their health and wellness facility. A landing page like this would be used to educate and convert traffic from things like online advertisements promoting the facility. Informed. True Health and Wholeness makes sure to provide as much information possible to their visitors on why they should choose True. Visitors can learn what they get, see real life success stories, and learn about the excellent True team. The more questions you can answer on your landing the less friction there is to convert visitors. Visual. This page by our standards is very visual. Like I said before images go a long way in helping you communicate your business' value proposition. People, especially online readers, like things to be easy. Using images to supplement or replace blocks of text make the experience much better for your visitors. The color scheme. This particular color combination says a lot about the page - it even reveals their target market. The black, vibrant red and gold communicates strength and endurance, which appeals to masculine sensibilities. The header image with client testimonial. This is great because the image is the first thing people see on your landing page, and this one in particular has multiple functions. The succinct testimonial positioned on top of the image helps ensure trust while the image behind it is visually appealing (also, “Vogue” works out there? They must be legitimate and exclusive”). Bonus: we get a sneak peek of what their gorgeous gym looks like. The value proposition. It’s positioned in the right place on the page, as it should be one of the first things people see on your landing page. There’s no risk or obligation associated with “free,” which makes it an effective value proposition. Entry form placement. People generally read landing pages in an “F” shape, starting at the left and working to the right. This entry form is in the correct place because first they see the the image, the value proposition and then the entry form. Multiple trust factors. The phone numbers, social buttons (at the very bottom of the page) and the above mentioned customer testimonial all help to increase the trust of the landing page visitor. The font in the header image. It stands out well on the graphic and is very easy to read due to the font size and the typography style. Pinnable images. It’s always good to have images that can easily be shared on social networks, linking back to your landing page. Eliminating the navigation bar. This common (yet detrimental) mistake distracts visitors from the CTA and can lure them away from the purpose of the page - a specific point in your sales funnel. The entry form colors. It blends in like a chameleon. I would suggest encapsulating the form in either red or white to make it more noticeable. Different call-to-action (CTA) copy. “Submit” is a completely overused word that does not get the best results when it comes to CTA copy. Instead, try testing a phrase that encourages them to click, such as “get my free workout” or something along those lines. Getting rid of the chunky text below the fold. Say no to blocks of text on your landing pages. You have 5 seconds or less to convince a visitor to stay on your page, and blocks of text are one of many landing page mistakes that will make them bounce. If you absolutely must include more text, consider a lightbox. Highlighting the benefits and unique selling point (USP). Hidden in the mounds of text is their list of benefits, which highlights the unique selling points of the gym. These should be more obvious and appear above the fold, possibly below the banner image. Less fields in the entry form. 10 fields to fill out is a bit much. I would try cutting out a few such as “have you been a member of a gym?” and “how did you hear about us?” This landing page directs from an ad, so chances are that’s why they ended up on the page. Putting more emphasis on the entry form. I would consider using a directional cue on this landing page that points or directs to the entry form. The background image. It’s a little distracting from the landing page itself. The benefit lis t. Presented in an easy-to-read, condensed format. The number of fields in the entry form. There are 4 mandatory fields and one optional. This is not an intimidating amount of form fields and is totally appropriate for what they’re giving you. The value proposition. Free is most valuable thing you can offer. The unique selling point. “Burn 1000 calories!” Woah. It’s okay if you eat a lot, because you can burn off 1000 of those calories at Knockout Fitness! The entry form headline. The red surrounding the text contrasts well with the black and white on the page. The trust factors. The assurance that your information is protected allows visitors to trust the landing page. The logo on both the punching bag and the top of the page help ensure their trust as well. Lack of distractions. There’s no navigation bar (a common distraction) or multiple CTAs. This landing page has a clear focus with the entry form - they want leads. Correct the grammar and punctuation. I’m going to be a little nitpicky here - there are a few words that are randomly capitalized (and not capitalized) in their benefit list. Grammar nerds such as I notice things like that, and it damages our opinion of the otherwise professional-looking landing page. Directional cues. For this landing page, I would definitely try out some subtle directional cues. For example, the woman glancing at the entry form (which causes page visitors to look at the form, also) could possibly improve this page’s conversion rates. A simpler way of trying out this tactic would be by pointing arrows from the benefit list to the entry form. Less benefits. The fact that they have a benefit list is really great, but I would try cutting down the amount of points they make and focusing on the most unique selling points. Try for 5-7 points. More trust factors. The logo and assurance that your info will be protected could be enough to trust the landing page, but I would really consider including a more focal trust factor such as a customer testimonial. Hopefully this article has inspired you to get started using landing pages for your fitness business. Remember, a landing page is built to get you conversions by having only one conversion goal. It’s key to remember that when it comes to optimization there are always changes you can be making to your landing pages. And sometimes, the most unexpected modifications can increase your clicks or lead generation substantially. What kind of optimization tactics have you tried implementing? Have you had success with any unpredictable changes to your landing pages?